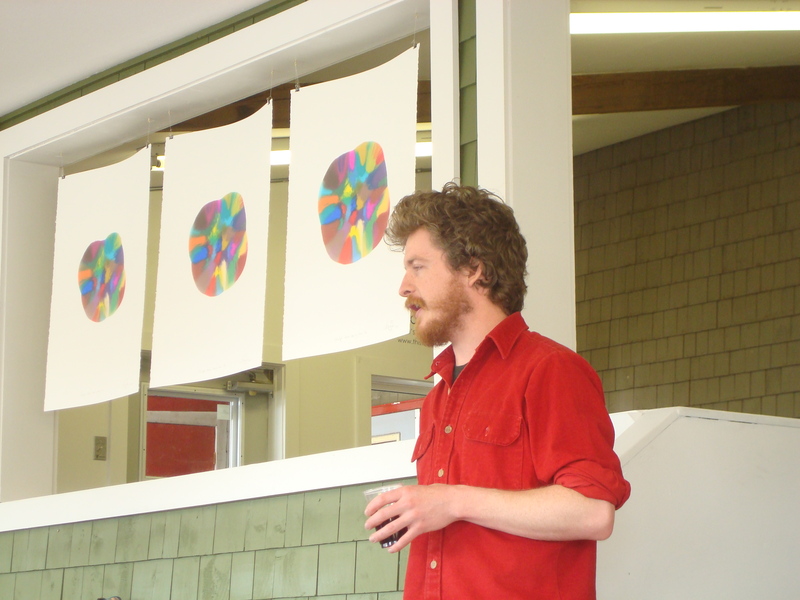 A good-sized crowd gathered at the small town market gallery after the closing of the Charlottetown Farmer’s Market on the 29th of March to listen to Lunenberg, Nova Scotia artist Andrew Maize talk about his new marker drawing series. Maize, who decided art was his calling as a teenager, after seeing a video of Jackson Pollock at work, has been experimenting with creating art from found materials for several years. He believes that “there is a lot of potential in found materials” and is always considering how such materials can be used in different ways. His current exhibit is testament to this philosophy. He has been collecting used markers and using them in unusual ways to create art. On display until the 17th of May, his latest Chartpak Marker Drawings Series is a series of 12 “drawings”—his interpretation of drawing the ink out of used markers by standing them tip down on a pile of highly fibrous paper and letting gravity do its work by making the marker ink leak onto the paper and seep through the layers for 3.5 hours. The markers were arranged in random order in the same box they came in. What is interesting about this work, is how each marker stain finds its space on each sheet and how some stains are completely ‘spaced out’ while others take on larger or different forms. Each sheet shows the slightest transformation so that they are almost the same from one to the next, but are quite different two or more sheets away. It makes me think of an exercise used in analyzing how a message changes with each transfer. In most cases, messages are distorted one or two words at a time until the end message can be completely different from the original. In the same way, the original “drawing” is completely different from the final one in Maize’s series. Another point Maize brought up was how, no matter how useless or invaluable the found materials are, once they are transformed into art, they attain a certain value that makes the artwork precious, at the very least, to the artist. It was probably by serendipity that the choice of mounting (bulldog clips and string in the upper corners of the drawings) emphasized the fragility and vulnerability of the works in their unusual gallery setting, which in turn highlighted how delicate and precious they were. Certainly, this must be an attachment all artists acquire with their works, especially when they have been completed, and Andrew’s experimental art shows how much value can be generated by the creation of art from things other people normally discard. This entry was posted in Uncategorized and tagged Andrew Maize, art, art reviews, artists, Charlottetown Farmer's Market, experimental art, Making a Mark with Markers, marker drawings, small town market gallery. Bookmark the permalink.